The idea of big brokerage “leadership” is often associated with executives in the C-suite, vice presidents, regional directors and the like, but when Howard Hanna president, Howard “Hoby” Hanna, talks about developing leadership at the country’s largest privately owned firm, he emphasizes the need to focus on middle management. “The bigger development challenge is the branch manager or sales manager,” Hanna told Inman in an interview. When makes two branches of a company within a five-mile radius substantially different? “You put everything aside, and the reason is the leadership a lot of the time,” said Hanna. Therein lies the importance of having solid managers heading up a brokerage office and working with agents on their day-to-day business. The development of leadership isn’t easy, Hanna admits. It takes financial and time commitments by the company, which has 9,200 sales associates and 262 offices across Pennsylvania, Ohio, New York, Virginia, Michigan and North Carolina, among other states. Howard Hanna has found its best sales managers come out of the company’s sales force because they can relate to an agent’s lifestyle and what it takes to succeed. The real estate firm has a leadership development program not just for managers but also for agents, loan officers and other employees. For one up-and-coming company star, the leadership program expanded her view of the company and what she could achieve there, said the company president. “We often say it’s not a class to be a manager but one to be a leader,” Hanna said. The more leaders in the company there are, the better contribution they make, argues Hanna. They understand how to take ownership and communicate. (Inman’s Leadership Survey found that real estate pros believe the most important qualities in a leader are their communication skills, integrity and willingness to listen.) Howard Hanna sends around five to seven managers a year to additional leadership development classes to listen to different speakers and experience growth. Howard Hanna has recently partnered with Larry Kendall’s Ninja Selling, a program based on the philosophy of building relationships rather than selling, which has proven to shift agents’ thinking. Meanwhile, expect to see some more merger and acquisitions (M&A) in 2018 from the Howard Hanna leadership made up of family members at the very top — Hoby as president, and his aunt, Helen Hanna Casey as CEO. Another two acquisitions are expected to be announced before the end of the first quarter to take it to a total of four for the first three months of the year. Hanna said he is working on a couple of Midwestern acquisitions in new markets most likely in the second quarter. “If we did one of them or both of them, it would be transformative,” he said. Hanna says he doesn’t have a team calling up brokerages in markets of interest — rather, brokerages tend to approach Howard Hanna when the time is right. In a relationship-drive industry, having connections with peers throughout the country has benefited the company’s acquisition goals, according to Hanna. “They know we are hands-on when we do a deal and that we want their leadership to stay in place,” he added. 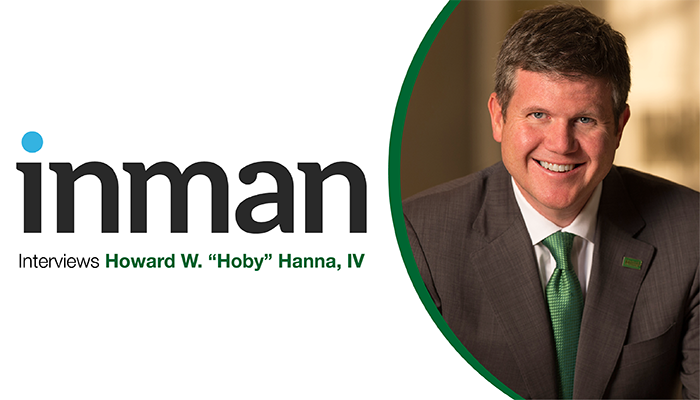 Unlike the franchise model, Howard Hanna allows for differences in styles from brokerage to brokerage. “How we operate in New York is very different than how we operate in Pennsylvania. There’s tradition that can’t be homogenized,” he said. And that’s attractive to broker-owners wanting to sell but not ready to move on. “We want people to grow, not just to maintain their growth,” he said.